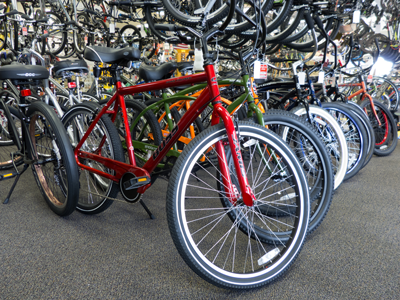 Most of bike shops in Broward have only few dozen bikes in stock and ready for purchase. At Frenchies Bicycles in Margate – Broward, you will find hundreds of bikes ready to roll out the door. Our selection of bikes and accessories is vast and offers everything from your child’s first bike to pro-ready machines at discounted prices. If you’re looking for bicycle accessories, rentals, sales and repair, you’ve come to the right place. For over 50 years, Frenchies Bicycles has been serving the cycling needs of residents in the Ft. Lauderdale, Florida region. 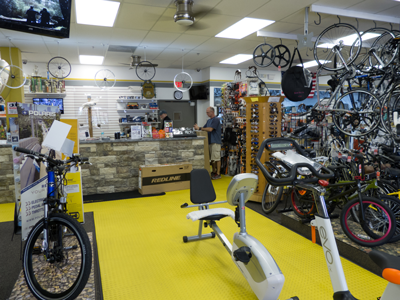 In our bicycle shop we provide personalized customer service, parts, and a friendly, inviting shop atmosphere. Whether you are looking to rent or buy, we have a large selection of bikes to choose from. Frenchie, the owner, will be there to greet you and offer his most straight advise on the bicycle you are looking for. 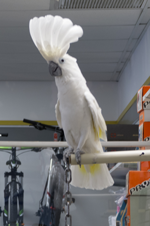 In a low pressure environment -with the most delightful pets around you- your experience at the shop will be exciting and amusing. When you purchase a new bicycle from Frenchies you receive unlimited free adjustments. Our free adjustments cover basic brake and gear adjustments and minor wheel truing on the bike, for as long as you own the bike. At Frenchies bicycles, our team of seasoned mechanics can calibrate, tune, tweak, true & polish. We get your ride running right & that gets the rubber on the road. Visit our bicycle showroom and you will also find a big selection of accessories, clothing, parts, and more. Located in Margate, You won’t find a more friendlier and competent bicycle retailer. Customers from Coral Springs, Parkland, Coconut Creek, Boca Raton, Fort Lauderdale, Lauderdale by The Sea, Pompano Beach, Deerfield Beach, Miami and others have relied for decades to provide them with the hardware, support and bicycle expertise at a level that only Frenchie’s Bicycles can deliver.